A perfectly cooked Basmati rice is all you need to make everyone hungry. 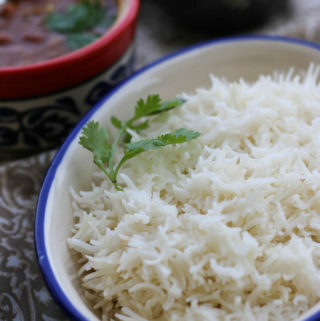 As the rice cooks, the aroma of Basmati rice reaches beyond the kitchen, to every room, inviting all to the dining table! 🙂 Here are my two tricks on how to cook the perfect Basmati Rice that looks and tastes delicious! 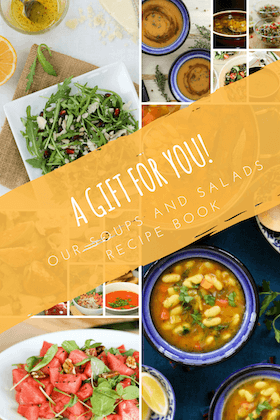 At the end of almost every Indian main dish recipe, you will come across the sentence – “serve it hot with roti or rice.” Very often, this rice is white long grain basmati rice. This is the foolproof recipe to cook Basmati rice not sticky and fluffy, each time. It is simple and quick. While for our regular everyday cooking we have moved to the healthier brown and red rice; an Indian kitchen cannot keep Basmati rice away. 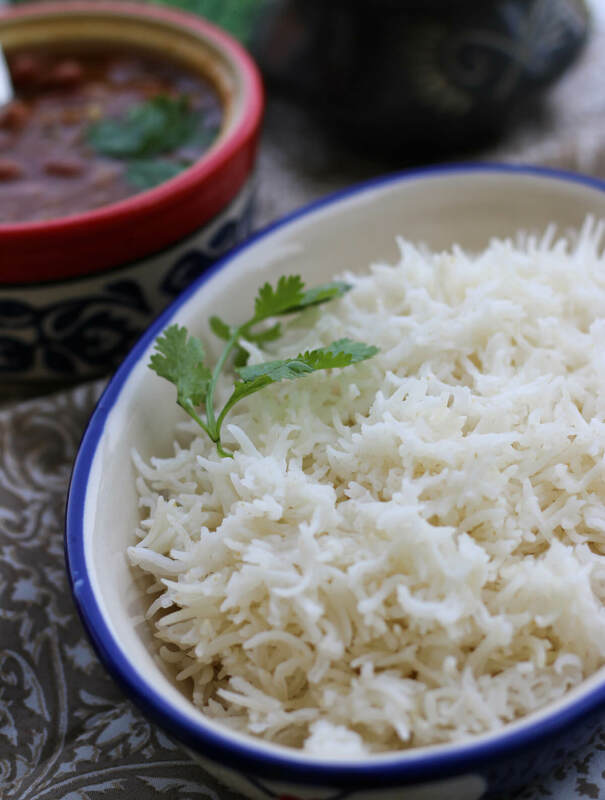 Now, I mostly cook white Basmati rice only while hosting at home or in specific dishes like pilaf, biryani and sometimes for sweet dishes like kheer. How to cook Basmati rice not sticky? The first thing to remember is the Basmati rice to water ratio. It is always 1:2. 1 cup Basmati rice will cook perfectly well in 2 cups of water. The second trick is to get as much starch out as possible. Prepare the Basmati rice by washing it multiple times before cooking. Rice has a lot of starch that makes the grains stick to each other, by washing the rice in multiple changes of water helps remove this starch. You will see the water will at first be very cloudy and then become clear in subsequent washes. Removal of starch leads to fluffy rice and also makes it easier to digest. How much Basmati rice should I cook per person? When served as an accompaniment or side with a curry, about ¼th cup (50g) of uncooked Basmati rice (1 cup basmati rice = 200g) is a good quantity per person. When cooking for 3 or more people, I always add “1 portion for the table”, that is, I will cook an extra ¼th cup. I don’t want to fall short on rice and cooked Basmati rice stays well in the fridge for the next couple of days so if there are any leftovers, I can use it the next day. If you like this recipe, please take a moment to leave a rating below and/or your comments after the post. It will really encourage me. Beautiful long-grain aromatic Basmati rice can take the lime light away from any main dish in an Indian menu! The trick to cook perfect Basmati rice lies in removing all the starch. 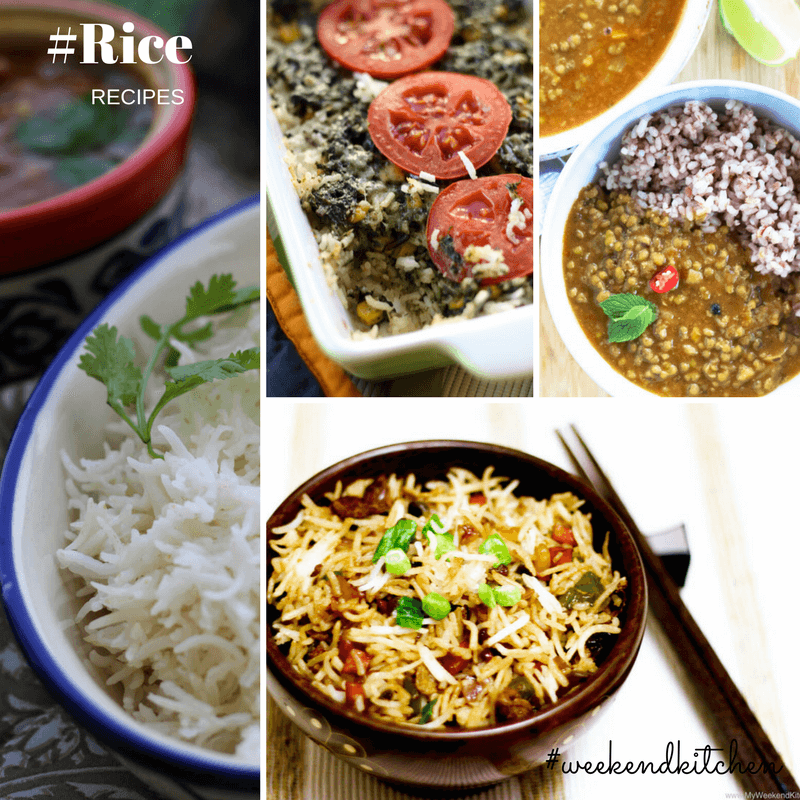 Follow this simple recipe to cook the best Basmati rice, every time. Take the rice in a big bowl and fill it with regular water. As you swirl your hand through the rice and water, the water will go cloudy with all the rice starch. Drain the water through a sieve and repeat washing the rice until the water runs clear. This usually takes 3-4 changes of water. Fill up the bowl with water and let the rice sit for 10 mins. In a pot, bring 2 cups of water to boil. Reduce the heat to low. Drain the rice and add to the water. Add ghee, salt, and cloves. Give everything a mix. Close and cook on the lowest heat for 15-20 minutes till all the water has been absorbed by the rice and the rice is cooked through. Remove from heat and let the rice stand covered for 5 mins. Open and take in the beautiful aroma. Serve hot with dal, curry or any other main. Plain Basmati rice is also the starting point for many dishes like rice stir-fry or tomato rice. also it requires longer to cook, about 30 mins.